We haven’t yet had an opportunity to tear down a dexterity game on Meeple Like Us, and I’m always interested to see how a new type of game fares when we put it under our heuristic lens. 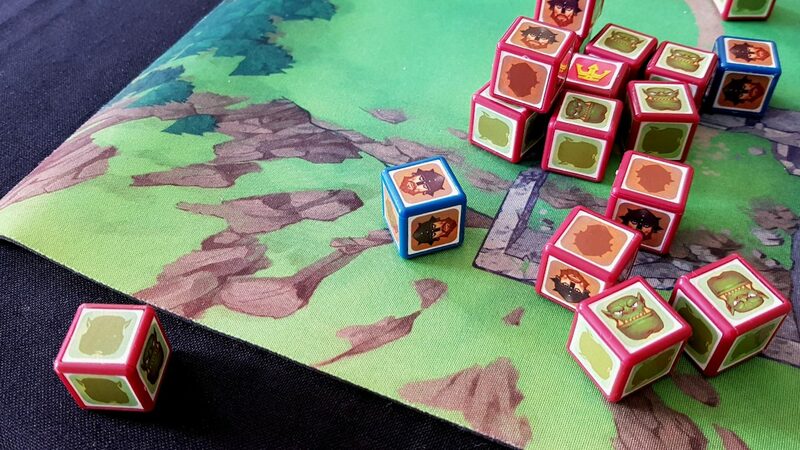 Cube Quest is one of the simpler games in this family, but that doesn’t necessarily mean it’s going to be easy to play. We gave it two and a half stars in our review, noting with some sadness its fundamental limitations. It’s a game we want to like but it very soon overstays its welcome. There are many others that like it more than us though so enough prevaricating – let’s flick the cubes and see where they land. The only reason that colour blindness isn’t an especially large issue is because the visual differentiation of the game is terrible across the board. The colours are reasonably easy to tell apart but there just isn’t a lot of the colour to differentiate. Except for the king cubes, which do have notably different colouring, everything else is limited to a strip of the edge of the cube. The best I can say here is that those with the common categories of colour blindness will be able to play roughly as well as the rest of us but it’s going to involve a fair degree of peering around and close examination of cubes to make sure they’re the colour you expect. It’s not as bad as with Memoir ’44, but it’s a poor showing. That’s a blasted land most people will be fighting over. However, if monochromancy is an issue or there is some other flavour of impaired colour perception this is going to be a massively problematic game since colour is the only way to identify cube ownership. That’s s a hugely important part of assessing play. As such, we’ll offer a tentative recommendation here. 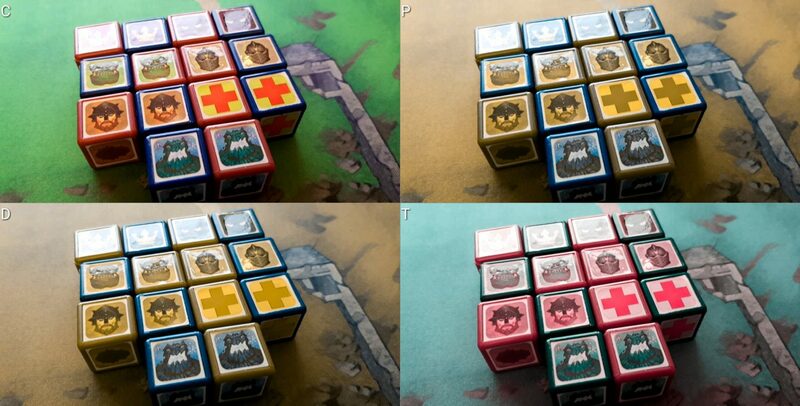 Cube Quest fares poorly in every category of visual accessibility. The game map is quite long, stretching from one side of the table to the other, and determining the position of individual troops is absolutely critical. As mentioned above, it’s not easy to tell ownership of cubes from a distance, and that problem is exacerbated if combined with visual impairment. Intermingled colours can be tricky to tell at a distance. Assuming you can determine the ownership of cubes, you also need to be able to reasonably precisely ascertain a visual intersection between your cube and the target. That requires a significant degree of precision of acuity as well as binocularity of vision. The extent to which this is required becomes greater the farther away the target is, and in early stages of the game it’s difficult even for fully sighted players to acquire a ‘target lock’ and meaningfully execute on it. The difference between a unit surviving an invasion and being captured is reflected in whether the shadow face of the cube is upturned or not. This is indicated by a silhouette with the same iconographic design as the main art. That’s fine for most of the troop types but not necessarily easy to pick up if it’s one of the grunts. The cubes are essentially lightly weighted non-standard dice too, which can be a compounding problem for visual identification. So much depends on distance, angle, and distribution of cubes that I don’t think you could realistically play with anything but the most minor of visual impairments. The cubes can’t be substituted for accessible variants either because each would need its own lookup table, and there is a specific weighting for the cubes that wouldn’t translate. Accessible dice tend to be large and heavier than standard dice. You couldn’t just put them in play and flick them even if you could find a way to cleanly represent the resilience of the various troops. Even if you could flick them, you’d find the game would become extremely unbalanced. As such, we can’t recommend Cube Quest in this category. 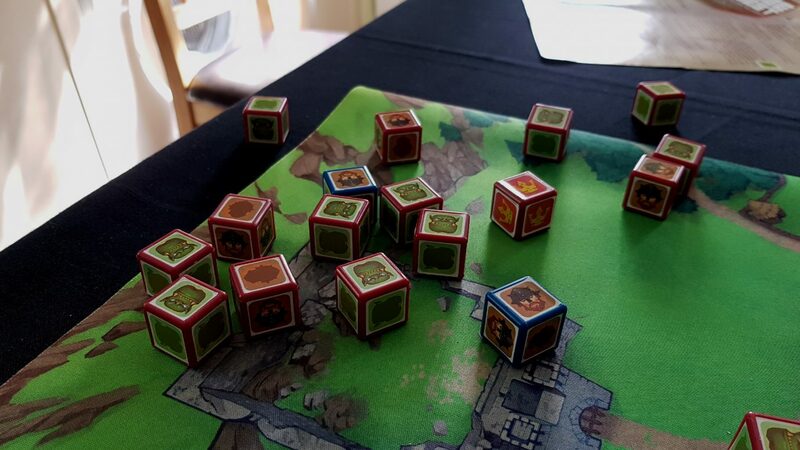 Cube Quest shines here – the rules are so lightweight, and the troop powers so straightforward, that I would have no hesitation in recommending it. It’s simple, it’s funny, and its key gameplay decisions are tactile. Many of the things I complained about in the review are straight up boons here – there’s hardly any game state complexity, no varying game flow, and no synergy or interplay between cubes. 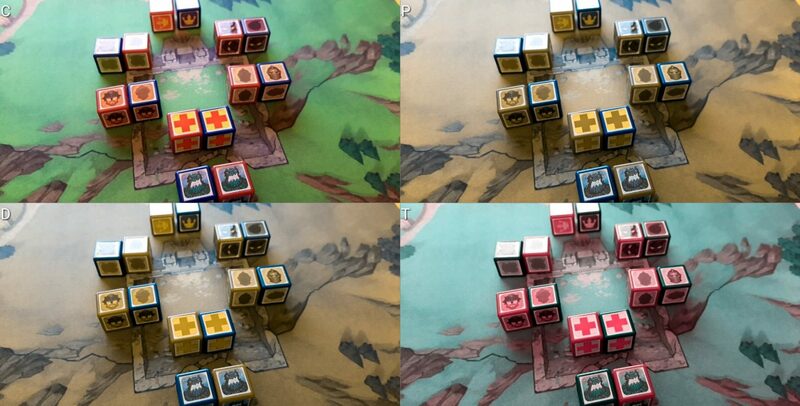 Even the design of the cubes is perfect for cognitive accessibility because they reinforce the risk of sending troops into enemy territory. You don’t need to work out anything – just roll the cube and it’ll tell you what happens. The only small area of potential concern is if you move to advanced play and allow players to purchase their own army deployments. That introduces a degree of numeracy, as well as an asymmetry in play that can complicate matters somewhat. Even so, it’s never going to spike up into the complexity levels that would render the game a problem. Facing calculation issues, it’s easy enough for another player to do the necessary arithmetic. There’s nothing to memorise – everything is all on the mat. Even the calculation and cogitation that we discussed in the review is something that’s handled largely intuitively, and truth be told you’ll have as much fun simply flicking the most obvious cube at the most obvious target. Cubes behave unpredictably on the high friction map, and it doesn’t do to overestimate how much influence we have over where the cube will end up once it’s been flicked. Cube Quest then gets a strong recommendation for both categories of cognitive accessibility. This is also an area where Cube Quest shines. Despite being a dueling game, there’s very little active aggression in play. You’re just as likely to embarrass yourself with an overly hesitant flick as you are to smash open an opponent’s defense. That goes the other way too. It’s funny to send a perfectly aimed cube at an opponent’s fortifications only to see it slide to a limp halt a couple of centimetres away from the target. It’s funny to flick your king at an attacker only to have them both sail off the side of the map. The whole thing is so inherently comic that it’s very difficult to take any of it seriously. You can’t feel too disheartened by the occasional times you mess up because just as often you’re pulling off magical trick-shots that were entirely accidental. Very little of it feels like it’s ultimately down to you, but enough of it does that you can feel good about success. You can discount losses and still get the warm glow of victory. That feeds into the fact that games are very short – the box quotes fifteen minutes, but I’m not sure I’ve had one last longer than five. As such, even if you lose it’s not long until you get a chance to even the odds. You have only limited ability over placement of cubes – flicking is, at best, an imprecise mode of locomotion. As such, those situations where you suddenly find yourself out-maneuvered are roughly counterbalanced by the times when you luck into the ideal attacking configuration. It’s explicitly a two player game, so while there is player elimination it doesn’t mean you need to wait around for the game to be over. Also as a two player game it offers no opportunities for ganging up, or king-making (or unmaking). The capture and release mechanics too mean that you get abundant opportunities to undo mistakes – you’re rarely left with nothing useful you can do. We strongly recommend Cube Quest in this category. You can probably imagine that this section isn’t going to have a lot of good news. Parts of Cube Quest are playable if someone has reasonably fine-grained control over their digits, but the playability drops away almost to zero after the setup and first turn has concluded. You have to think of Cube Quest as being part of the snooker family of games if you want a good idea of how it is played. 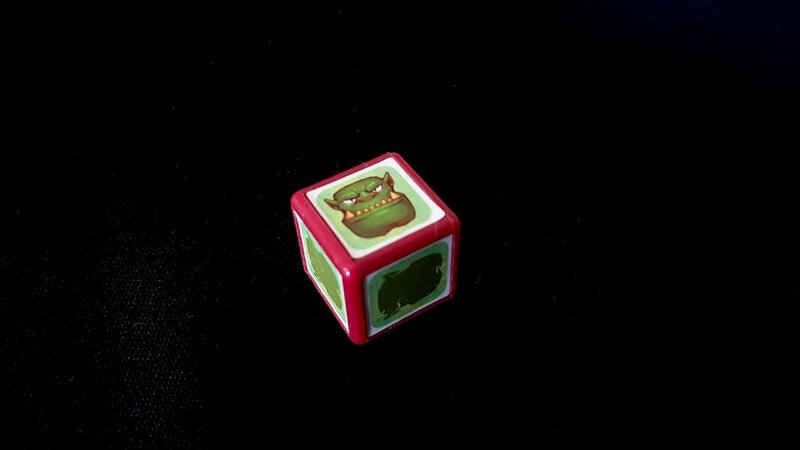 You flick your first cube, which lands in your opponent’s territory. They flick theirs, which lands in yours. Usually. It might not go down quite like this but it’s a reasonable base-line. You’ve got one in their land, they’ve got one in yours. What that instantly does is create two halves of the board where you must be able to manipulate and flick cubes. That requires you to be able to orbit the game mat and view it from all angles. You’re often going to end up with cubes in difficult positions, and you’ll find it necessary to angle fingers and limbs awkwardly to send one of your troops where you want it to go. The game comes with rules regarding ‘misflicks’, such as knocking an opponent’s cube or moving multiple cubes with a single action. You can do away with those, but you can’t eliminate the basic mechanics of physicality. It’s not even as if you can move the mat around so that it’s easily viewed from a sitting position – it’s in three parts, and the explicit position of cubes is important and easily disturbed. The cubes aren’t especially heavy, and they’re easy to flick but they’re also easy to flick off the table. One solution is to play on the floor, but that imposes its own physical burdens and in any case requires a lot of getting up and moving around. 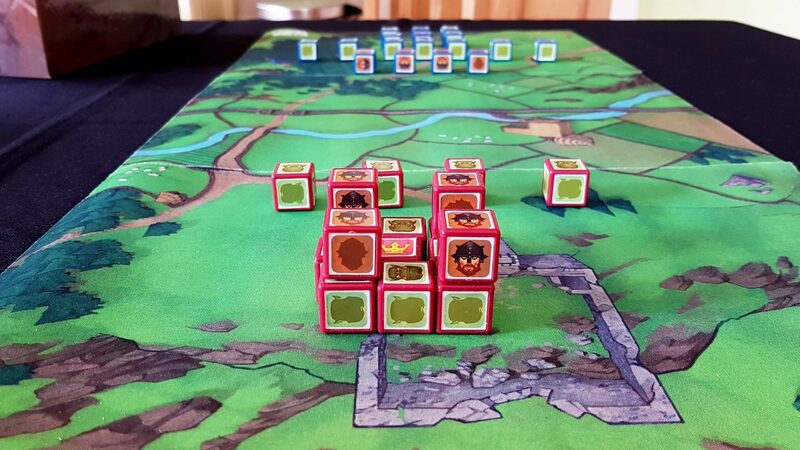 You spend a lot of time picking cubes up off the floor when playing, although if you have a dedicated gaming surface with a table well that won’t be quite so onerous a task. Verbalisation too is a non-starter of a solution because there are very limited opportunities to unambiguously differentiate pieces or locations on the map. You would also need to rely on the physical dexterity of a player making moves on your behalf. Not only that, you need to trust in their willingness to put every effort in to accomplishing an attack that can only be to their detriment. That’s hard for anyone to do, even if consciously that’s what they want. Assuming that’s even an option, there’s a bigger problem. In adopting a strategy of verbalisation you lose the tactility that defines the fun of interaction. Cube Quest without flicking is like poker without the cards. We can’t recommend Cube Quest at all in this category. There’s no reading level other than that which is needed to understand how the pieces work, and that’s easily explained by a second party. There is otherwise no need for communication associated with play. The cover art shows no women on the field of battle, and the game manual explicitly lists your key piece as a ‘king’. Other than that, there’s no explicit gendering in the manual and very little art to speak of except for that which represents the pieces. Those also are explicitly male. At an RRP of £25 and a player ceiling of two, it’s an expensive and inflexible prospect. As we discussed in the review, it’s also a game that is unlikely to sustain interest beyond a few (very fun) initial bouts of carnage. Game sessions are very quick, meaning it will easily fit into even a crowded schedule, but the counterpoint of that is that they will very rapidly drain the game of its novelty. However, this is a game I often see on special offer – I got my copy for a much more reasonable £10, including postage. I certainly wouldn’t recommend it in this category at its full RRP, but if you can find it cheaply enough it’s a reasonable addition to a game library – an ideal introduction to the genre of dexterity games, really. Overall though, we don’t recommend it here – not because of the gendered art, but because of the poor value proposition. Most of the intersectional issues we usually cover here are already obsoleted by base conditions – we don’t recommend it for people with visual or physical impairments, so the intersectional categories here just don’t factor into it. The only intersections to consider really are in the areas of emotional and communicative accessibility (where there are no serious issues) and in terms of emotional and cognitive accessibility. The largest factor for the latter tends to be the issue of downtime and it’s not really a problem here. 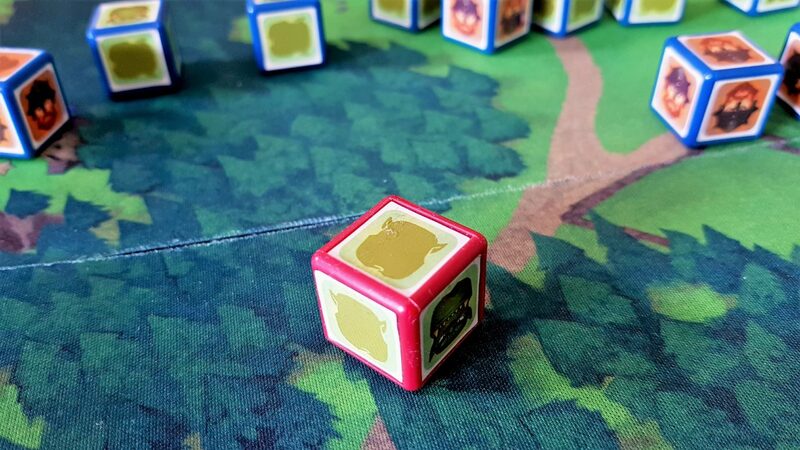 While it is a turn based game, there’s a meta-game for the defender in simply preparing to catch pieces before they fall off the side of the table. You might even formalise this with a catcher’s mitt or the box lid. In any case, you’re never waiting very long for your turn to come around, and you tend to be interested in what your opponent is doing. However, as an introduction to physical dexterity games, it’s hard to beat – at its best it’s a funny game and so straightforward that anyone can play it without worrying about cognitive cost. If you just want an easy, simple game that will get people laughing Cube Quest is a strong contender. 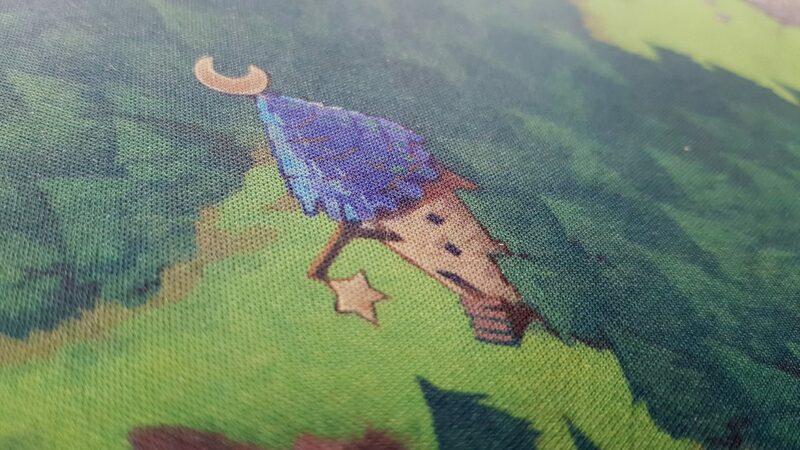 While we enjoyed Cube Quest a lot, we found that its fun took a nose-dive off a cliff after a few sessions. There’s not a lot in the box, and what novelty there is will soon be exhausted. We gave it only two and a half stars, although if it ever gets some expansion packs we’ll be happy to revisit. It’s not going to be an appropriate game for many potential players, but for some it’ll be an absolute blast.